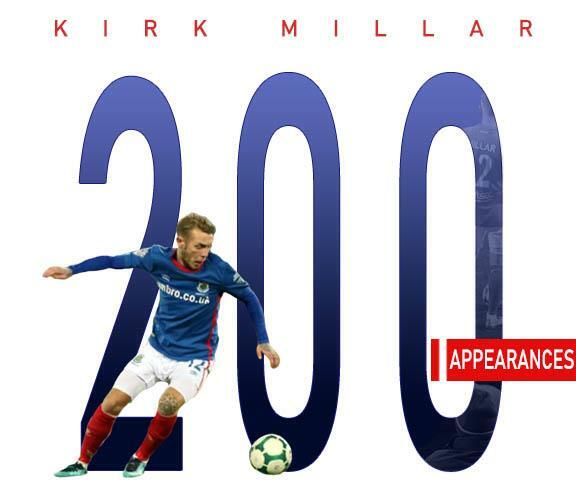 Kirk Millar made his 200th appearance for Linfield as a sub in yesterday’s Windsor Park Irish Cup game against Crusaders. The winger who came through the Linfield Academy, made his first team debut as a sub in a home CIS Cup defeat to Portadown on December 17, 2008. He then signed for Oldham in June 2009 making his first team debut there in 2010. After 38 appearances for Oldham and 8 on loan at Chorley, he rejoined Linfield on August 6, 2014. He made his Linfield debut in his second spell at the club as a sub in a 3-0 defeat by Portadown on August 9, 2014.